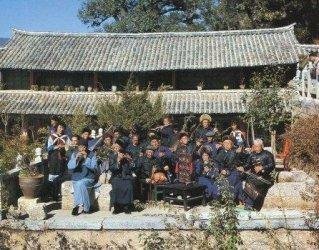 Lijiang is the base of the Naxi (also spelled Nakhi and Nahi) minority, who number about 278,000 in Sichuan and Yunnan. 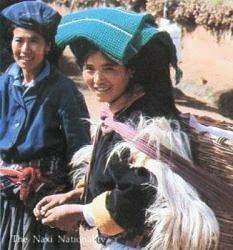 The Naxi are descended from Tibetan nomads and lived until recently in matriarchal families, though local rulers were always male. Women seem to run the show, certainly in the old part of Lijiang. The Naxi matriarchs maintained their hold over the men with flexible arrangements for love affairs. Both partners would continue to live in their respective homes; the boyfriend would spend the night at his girlfriend house but return to live and work at his mother's house during the day. Any children born to the couple belonged to the woman, who was responsible for bringing them up. The father provided support, but once the relationship was over so was the support. Women inherited all property, and disputes were adjudicated by female elders. There are strong matriarchal influences in the Naxi language. Nouns enlarge their meaning when the word 'female' is added; conversely, the addition of the word for 'male' will decrease the meaning. For example, 'stone' plus 'female' conveys the idea of a boulder; 'stone' plus 'male' conveys the idea of a pebble. The Naxi speak a language belonging to the Yi branch of the Tibeto-Burman family. 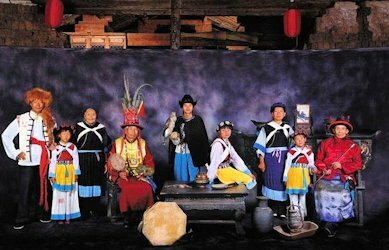 Traditional religions include the national worship of Dongba, lama Buddhism and Daoism. They are part of	the Sino-Tibetan Tibeto-Burman ethno linguistic group.